Magic Jungle is a set of toys that aims to bring children closer to animals and create a joyful experience shared with friends. The set, comprised of a magic wand and five animal characters, features multiple playing modes. Gently touch the heads of the animals with the magic wand and watch them light up. Switch on the sound mode to hear the animals sing, imitate real animal sounds, or play the music of a electronic piano and drum, creating the atmosphere of a carnival in a forest. 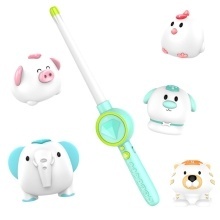 5 animal friends and one magic wand, touch animal&apos;s head to control one or all of them to light or make sound, no need any APP/BT. 4 sound mode: Education toys help kids recognize animals sound, musical instruments, play the drums with five different beats or listen to songs. 2 light mode: Light up one or all the animals, soft colorful light create the atmosphere of a carnival in a forest, perfect for kids&apos; party. Animal characters can serve as a night light to accompany your children to sleep, also be good bedtime story helpers that make your story more vivid. The products are made from RoHS material (ABS and Vinyl), no toxic or harmful substances included. ABS thick shell is wear-resistant and strong. Single playing mode: each animal has its own unique light up. Multiple playing mode: all the animals light up together. Animal sound mode: Imitate the real animal&apos;s sounds to feel as if you’re really in the jungle. Electric piano sound mode: Create melodies with your five animal friends. Drum mode: Play the drums with five different beats. Concert mode: Relax and just listen to the songs. You can damp the towel to wipe the surface of the toys. But we do not recommend you to give them a shower.